Base of Operations: Paradise Valley, U.S.A.
Powers/Abilities: Alex could transform into an animated metallic liquid, able to flow through small openings. She also demonstrated telekinesis and the ability to generate "zappers", bolts of yellow electricity she could fire from her fingertips. Her powers were somewhat unstable, and on at least one occasion, she also developed superhuman strength for a short period. 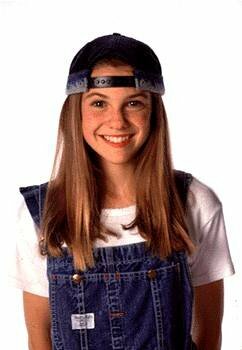 History: Alex Mack had just attended her first day of junior high school, when on her way home from school she narrowly avoided being hit by a carelessly driven truck. The driver, David Watt, narrowly missed her, but Alex was doused in a top-secret chemical, GC-161, which it was carrying. Alex was understandably less than pleased with being drenched, but soon discovered that there was much more in store: the chemical had altered her genetic structure, granting her superhuman powers. Confiding in her highly-intelligent sister, Anne, and her friend Ray (who saw her glowing), Alex tried to learn how to use her somewhat unstable new abilities safely. Her life is further complicated by the ruthless owners of the local plant where the GC-161 had originated, who have discovered that a child in the area has special powers, and are now seeking to identify the kid so they can exploit the superhuman for their own nefarious purpose. Comments: Played by Larissa Oleynik. Created by Thomas W.Lynch and Ken Lipman. The show lasted four seasons and seventy-eight episodes. There were also 34 books, aimed at younger readers, written based on the show - the final one appears to be a novelisation of the final episodes, but the rest appear to be original stories.